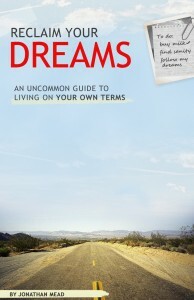 Reclaim Your Dreams: An Uncommon Guide To Living On Your Own Terms is a wildly successful e-book by Jonathan Mead. I first stumbled across Jonathan’s work on Zen Habits, where he contributes regular guest posts. As if being featured on one of the most respected blogs on the internet wasn’t enough, Jonathan is also the man behind the amazing content over at Illuminated Mind. For me, striving to eliminate debt and establishing control over my financial life is simply one small piece of the overall puzzle. Financial independence is nothing if you aren’t truly living out your dreams and enabling the dreams of your loved ones. Jonathan’s book not only contains theory that reinforces this believe, but also demonstrates tangible techniques that help accomplish it. For example, several times each chapter Jonathan takes a break to provide “Exercise” sections, which contain real, actionable material for you to try. Some examples include writing lists, fasting from media, and even creating a “to-stop” list. I, for one, appreciate this kind of direction. All to often personal development books get lost in the fluff. Jonathan has an amazing ability to provide theory that stretches our minds, while still giving us the kick in the pants we need to get rolling. “This is a declaration of authenticity, an act of spontaneity, and a call to live deliberately. Wow, I had really never heard it asked quite like that. I’ve heard, “What are your goals in life?” and “What do you truly love to do?” Somehow this question impacts me much different than the other two. It sends my brain searching in a way that the others don’t. He continues by summarizing how people default towards traditional objections and create excuses for why they aren’t living a life focused on what they truly love. Two things I read in this chapter really connected with me. First, Jonathan begins by exploring the internal struggle of establishing control over your thoughts. Second, he outlines how, starting at a young age, society slowly influences us to be more and more domesticated. I had never really thought about it in those terms. The more I reflected, the more I felt like I was being pushed into a domesticated role. I started to realize that I’m not quite ready for that type of lifestyle, yet. We give more merit to the bullet points on our resumes than the contents of our character. 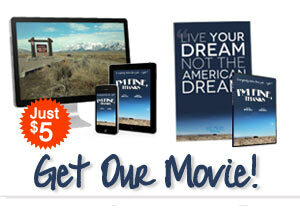 We care more about the size of our bank accounts than the fulfillment of our passions. Afterward, he goes on to instruct us how we can break free from living our life by a predetermined template. I feel like I could do a much better job at this. All to often I push myself to fit some other template. To go back to school, to get this license, or that certification. None of those thing would be inherently negative, but certainly none really get my blood pumping. This chapter’s discussion first centers around recognizing and discarding your limiting beliefs. I’ve read all sorts of self-help content on empowering and limiting beliefs. Somehow, the way Jonathan presented the material in the chapter sincerely sunk in. I think this was a combination of Jonathan’s unique voice and my current readiness to accept and apply this information. After reading these few sentences, I came to realize that most of the time I set out to determine what I’m really passionate about, I still find myself being fairly analytical and grounded. That’s no way to dream! For the first time, I really opened up and let this alter-ego take control when I was brainstorming. Afterward, I let my analytical side take a look over what I wrote. Even though I had done this process countless times before, the results I came up with this time were like no other. Jonathan also provides this insightful and practical content for Living Your Values, Developing a Personal Manifesto, and Creating and Using A Dream Sanctuary. If you could only read one chapter of this entire book, make it this one. Yet another area of my life that I struggle with is pushing my boundaries. If it’s in an area that I am passionate about, such as blogging or personal finance, it’s super easy. I’m always exposing myself to new theories, concepts, and people. However, what about the areas I’m not comfortable in. Fitness, for example. I’m horrible at pushing my boundaries and thus almost never make any noticeable growth in this area of my life. Jonathan takes this chapter to really push you to take on uncertainty face-to-face, as well as deal with people who might try to shoot down your dreams. He provides actual examples of things you can do to break your daily routines. I remember taking notes on how to apply his suggestions into my fitness routine (or lack thereof). I was ecstatic to see that this chapter wasn’t just another version of GTD. I’m going to be honest. I’m just not a GTD person. I’m sure the system works for some people, but I don’t connect with it. Luckily, it seems neither does Jonathan. Instead he focuses on eliminating “things” (and commitments) from your schedule altogether. I really needed this kind of reinforcement. Just saying “do what you love” isn’t enough for me. I need actionable steps to help inch towards my passions, which Jonathan provides throughout. This chapter also contains my favorite “Exercise” section. Instead of focusing on a “to-do” list, we are encouraged to create a “to-stop” list. This is to evaluate our lives and upcoming events and search for those that aren’t really in line with our goals. Especially for blogging, I’ve found that eliminating useless activities is just as important as getting useful ones accomplished. For all of you personal finance buffs, this chapter was written for us! Jonathan advocates tracking your discretionary spending, as a method of realizing where your current priorities are. Sacrificing the discretionary spending that is not aligned with our goals and priorities will allow us to refocus that money to actual accomplish them. Courtney and I have recently done just that. We’ve sacrificed and slashed our budget immensely, so that we could eliminate our consumer debt and save up to move to Australia. We understand that even in Australia, we will have to continue to live frugally and work to maintain our lifestyle. But, for us, the juice is worth the squeeze. Jonathan goes on to provide specific examples to start “creating love money,” including actually offering your services for free, at first. I know Jonathan has had success implementing this strategy in his own life. 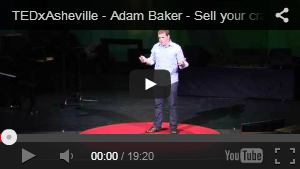 When he wanted to get into life coaching he put up an offer to take on newcomers for free. This produced an enormous waiting list of people who desired to participate. He is not only honing his skills, but has built a large list of people that would still be interested even as he begins to charge for his service. His personal example has me brainstorming on what I could be doing for free that would both help me learn, as well as be valuable for the participants involved. This chapter is really about overcoming naturally occurring obstacles that come up after we start down the path of living out our passions. It discusses in detail how to not force your passion into work and thus lose it altogether. It also touches on maintaining balance and dealing with what I call “the grass is always greener” syndrome. Jonathan’s conclusion ends like his book began, with short and sweet calls to action. When I set out to write a review for this e-book, I promised myself to be honest no matter how I felt. After all, I do no one a service by sugar-coating my true feelings. As you can probably tell, I was absolutely blown away by Jonathan’s message. I’ve read at least a couple dozen e-books from some pretty big names, but none have had the impact on me that this did. It pushed the limits of my thinking… It caused me to dream more passionately… And most importantly, it reinforced this little feeling I had deep down inside me. I’m excited again to leave for Australia and even more committed to sacrificing and making this blog the best it can be. What I’ve outlined above is only a small fraction of the content that is packed into this e-book. Jonathan’s unique voice and short, easy-to-read paragraph style captures your attention early and doesn’t let go until the last page. You can get more information by visiting the official site of Reclaim Your Dreams: An Uncommon Guide To Living On Your Own Terms. 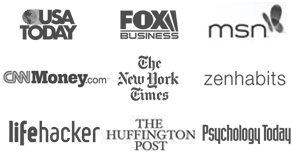 In addition, you can visit Jonathan at Illuminated Mind or read his regular articles over at Zen Habits. If you’ve already read the e-book, please feel free to add your comments below! My 1-Hour Blog Talk Radio Session With Ask Mr. Credit Card! I will have to check this ebook out this weekend. Chapter 6 looks like it would really connect with me. It is a constant struggle I go through. I always look at free time as if it were in direct opposition to career advancement. I know I am wrong but it is one of those principles that is hard to overcome. Thanks for the suggested reading! Great, detailed review. I have read a number of things from Jonathan and have been really impressed – he gets beyond mediocre rehtoric and really opens things up. I haven’t read the e-book but will do soon. I am downsizing, I have changed my life, let go of so much crap – stuff, people etc. This ebook sounds like it’s in line with all of that. Thanks for the review.